The purpose of this review is to highlight the potential of a rodent model in providing clues to possible viral mechanisms in neuropsychiatric disorders. As evident from the various essays in this volume, the term “model” can be defined differently depending on its intended purpose. 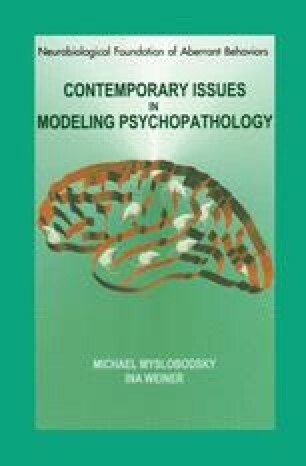 In my opinion, animal models aimed at elucidating the fundamental pathophysiology of psychiatric disorders are most informative when experimental results are used in a manner analogous to a mathematical result in a computer iteration. That is, the data from the animal model are used to construct a preliminary explanatory mechanism that is likely to be imprecise, but points nonetheless to a new set of experiments involving the actual human disease. The results from the human experiments in turn yield data which direct refinement of the model. As this process is repeated, successively better approximations of the human disease entity are attained. In contrast to models used expressly for the screening or evaluation of therapeutic drugs, all models directed at uncovering fundamental mechanisms of a given human disease will become obsolete as that disease becomes better understood. For many models “obsolescence” occurs relatively early in the process as the model no longer serves to suggest experiments related to the human disease.